The program since its inception in 2010 has generated millions of testing miles being completed. The mileage accrued on the testing vehicles, as well as, the hands on vehicle evaluation inspections have resulted in significant improvements and overall quality of the vehicles being produced. These results have reduced warranty defects, improved reliability, which has resulted in increased sales for the Auto companies. Based on all of these factors, our client has announced significant expansion of the program supporting multiple OEM customers. This opportunity will allow candidates to experience the cutting edge of automobile technology. If people are interested they should send their resume to drivers@reliance-one.com or call 248-393-1030. Reliance One Walks for a Cure! Auburn Hills, Mich. – Last Saturday, thousands of people came out for the 21st annual Susan G. Komen Detroit Race for the Cure in downtown Detroit. . A number of Reliance One employees and their families participated in the 22nd annual race. “The weather was beautiful and it was great to see such an amazing turn out. This is such a great cause and we are glad that we can contribute towards the research and the cure of breast cancer.” Says, Chad Toms, National Sales Manager at Reliance One. Susan G. Komen, who is the global leader of the breast cancer movement, is an inspiration who fought breast cancer with everything she had. Throughout her diagnosis, she spent her time coming up with ways to make life better for other women fighting breast cancer instead of worrying about her condition. Nancy G. Brinker promised her sister that she would do everything she could to end breast cancer forever. That ‘promise’ is now known as the Susan G. Komen for the Cure®, which has invested more than $1.9 billion since its start in 1982. They work together to save lives, empower people, ensure quality care for all and motivate scientists to find the cures needed. Thanks to events, such as the Susan G. Komen Race for the Cure®, and generous contributions from sponsors and fellow supporters, they have become the largest source of nonprofit funds devoted to the fight against breast cancer in the world. Reliance One Hosts the Hispanic Chamber and welcomes Camilo Suero. Auburn Hills, Mich. – Last Thursday, Reliance One hosted a networking event Tercer Jueves (Third Thursday), welcoming the Michigan Hispanic Chamber of Commerce (MHCC) and Camilo Suero, who is MHCC’s new Executive Director. The event took place at Reliance One’s headquarters, located in Auburn Hills, and was a great success. “We are excited to have Camilo as the new Executive Director of the MHCC. His experience and enthusiasm will bring value to the over 11,000 Hispanic Owned businesses in Michigan.” Says Jim Beath, President of Reliance One. Camilo Suero spoke about the strategic direction of the MHCC as well as upcoming events. Established in September of 1989, The Michigan Hispanic Chamber of Commerce is a non-profit business association governed by a 30-member Board of Directors that embodies the business diversity of its membership. They are the leading gateway to the state’s 11,000 Hispanic businesses and over 400,000 Latino consumers. MHCC serves as an activist for jobs and economic development by sponsoring participation in supplier diversity development programs and international trade with Mexico and other Latin American countries. MHCC’s membership mirrors the assortment of Hispanic business enterprises in the state. Their member firms have steadily been ranked among the Top Hispanic-owned firms both regionally and nationally. Jump for a Cause with Reliance One! 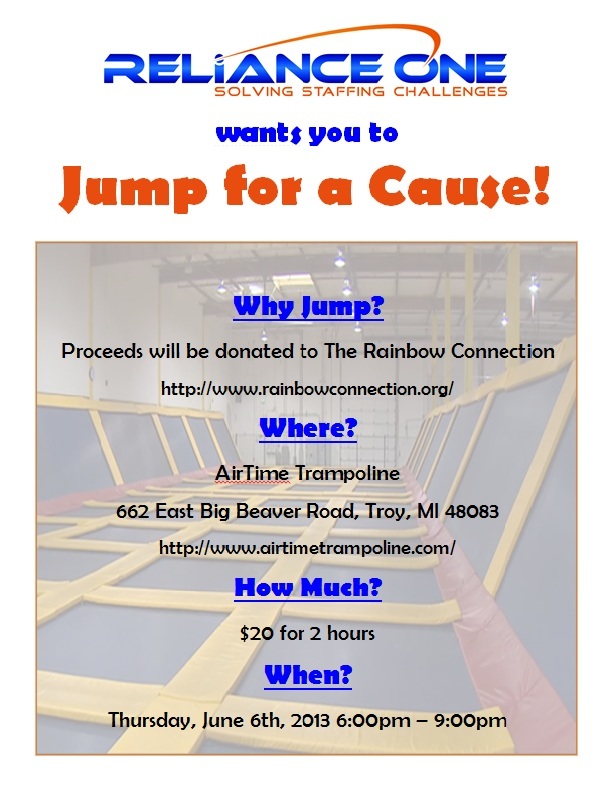 Auburn Hills, Mich. – Come out to Airtime Trampoline & jump for a cause with Reliance One on June 6! Check out our flyer for more information & you can either bring in the flyer, or just let them know you’re there to jump for Reliance One! Looking forward to seeing you there!